The Meinl Percussion Headliner Series Hi-hat Tambourine adds a great-sounding percussion instrument to your drum set. 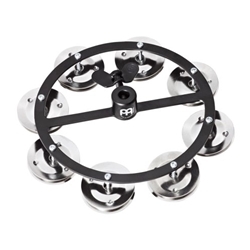 The Hi-hat Tambourine uses a rubber playing surface and eight pair of steel jingles for a cutting sound that will be heard through even the loudest ensemble, without the undesired stick noise. Its steel construction ensures that it will survive a ton of abuse, and makes sure the tambourine stays silent when you want it to. And its wing-nut assembly allows for very secure mounting on your hi-hat stand pull rods. Meinl wants to add new dimensions to your set with their Hi-hat Tambourine. The Meinl Percussion Hi-hat Tambourine adds a great-sounding percussion touch to your kit.